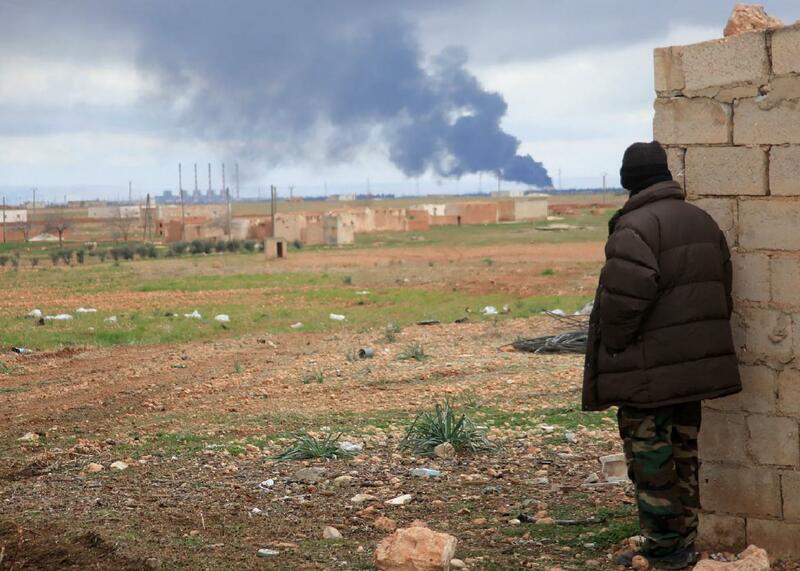 Syrian government launches major offensive while peace talks falter. A member of the Syrian pro-government forces looks at smoke billowing from an Islamic State group position following an airstrike in the Hatabat al-Bab area, near the town of Al-Bab in Aleppo’s eastern countryside, on Jan. 24, 2016. Syrian regime forces, backed by Russian airstrikes, launched a major offensive north of Aleppo this week. Control of Syria’s largest city has been divided between rebel and government forces for years. The Syrian military is reportedly close to breaking rebel sieges on two government-held villages, which would cut off supply lines between the opposition-held parts of the city and Turkey. Russian planes backing the offensive have reportedly carried out more than 300 airstrikes in the region. The latest offensive comes as rebel and government negotiators are in Geneva for U.N.-backed peace talks. Expectations had already been set extremely low for these negotiations. The umbrella group representing the Syrian opposition had initially refused to attend the talks until airstrikes were halted and sieges lifted. Opposition delegates, under heavy pressure from the U.S., eventually decided to attend but made clear that they weren’t expecting much. “We are not here for negotiations, we are here to test the regime’s intentions,” one opposition official told Reuters. It’s not particularly high between their foreign backers either. Secretary of State John Kerry called on Tuesday for Moscow to halt airstrikes, but his Russian counterpart insisted that bombing would continue “until we defeat terrorist organizations like al-Nusra,” referring to the al-Qaida affiliated rebel group that has a presence in the area around Aleppo. As James Traub writes, the Obama administration, which sees this peace process as vital to the effort to combat ISIS’s global spread, doesn’t appear to have a plan B for what happens if talks collapse. As with the Iran nuclear talks, the plan seems to be to just keep them going indefinitely, no matter how remote the chance of success. The difference is, if those talks collapsed, the two sides went back to the status quo. In Syria, the situation on the ground is rapidly shifting in one side’s favor as the talks drag on. Even under the best-case scenario, Mistura says that the initial phase “proximity talks” could last for up to six months before the two sides are actually ready to meet face to face. An agreement will take far longer. Given the degree to which Russian airstrikes have shifted the balance of power in Syria, the opposition doesn’t have that long.